The movie franchise that introduced the world to the damage a sports almanac can do is returning in a new videogame series. Jurassic Park isn't the only classic property Telltale Games has signed a deal to revive in videogame form. The episodic adventure game developer is also bringing back a franchise that's much closer to my heart: Back to the Future. Don't know what Back to the Future is? I feel very, very sorry for you. It's a series of three movies released in the late 1980s starring Michael J. Fox as fun-loving time traveler Marty McFly and Christopher Lloyd as wacky DeLorean time machine inventor Dr. Emmett Brown. They're must see movies for every human being. It turns out that Telltale's deal with Universal for Jurassic Park is really a two-title deal that includes Back to the Future. This means that the company will be developing a new episodic adventure game series that will add what Telltale is calling "compelling new content" to the Back to the Future universe. They'd just better get it right. Hoverboards don't work on water, Telltale, please remember that. We'll also be expecting a mini-game where we play as Biff and smack McFly on the head while saying: "Hello... McFly?!" Back to the Future is a very popular retro franchise that has sadly been absent from the modern remake train, so this could be the most amazing videogame announcement I've heard of since sliced bread. 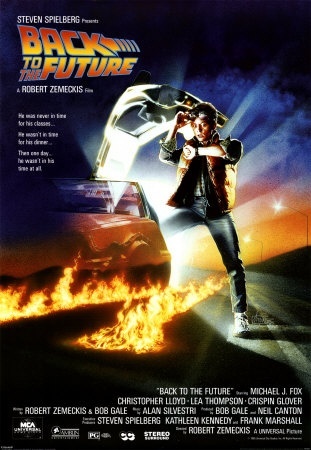 Telltale plans to have the first episode of Back to the Future ready to go in winter 2010. Hopefully it won't be late for school and have to hitch on the back of a pickup truck.